Suzanne Shoemaker works with Shredder on the creance line. Photograph by Callum Lewandrowski. Happy New Year! 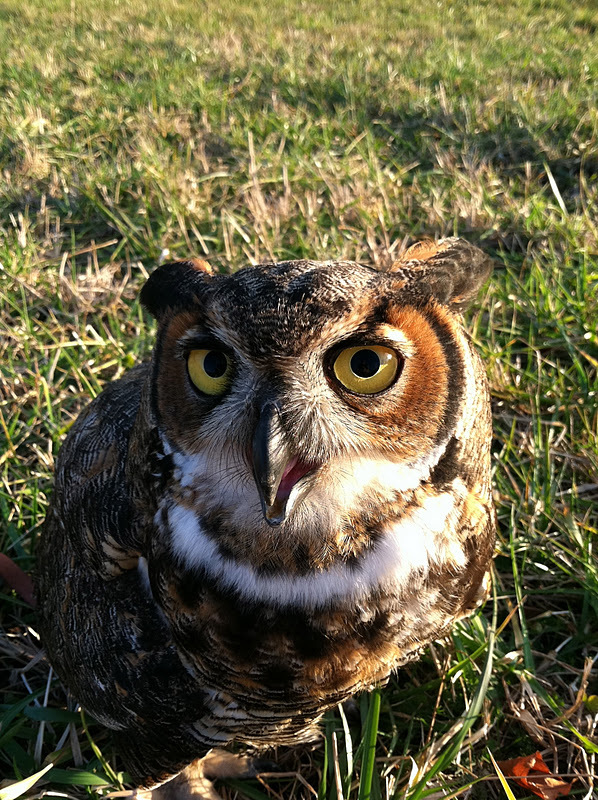 2011 went out with a bang here at Owl Moon Raptor Center. As a result, I’m afraid I’m a little late writing my update this week. Mother Nature keeps her own schedule, so it’s up to me to keep up and find time to write when I can. Pasadena, a juvenile red-shouldered hawk named for her hometown joined Squeak-toy, Soldier-girl, and Rufus in the mews. I first received the call about her back on the night of December 6th. Crisdee had seen her first the previous afternoon, perched on her son’s slide. When Crisdee saw her again the next day she was on the ground. It was raining, so she knew the hawk must be injured or sick to still be there. Crisdee called her mom, who tried calling a number of rehabbers in the area, but by then it was after dark, and none could make it over for a nighttime rescue. Crisdee’s mom reached me at about 8 pm. I live two hours away, so I too was unable to make it over that night. Instead I called Crisdee and convinced her that she could safely capture the bird herself if she followed my instructions. I stayed on the phone while Crisdee gathered the necessary supplies, and talked her through the process. Step one: Put on gloves, Step two: Gather up sheet such that you can throw it over the bird, Step three: Slowly approach the bird, talking to it quietly, if possible back it against a barrier of some kind or between people. Step four: Toss bed sheet over bird. Step five: Place cardboard box over sheet and bird. Step six: Slide cardboard or poster board under box, bird, and sheet. Holding sheet of cardboard tight to box, slowly flip all over so as to contain bird in box with cardboard cover. At this point you can lift cardboard slightly and if the bird is covered by sheet, close box flaps and carefully slide sheet out of a small opening. Step nine: Throw sheet over box. Crisdee was triumphant! 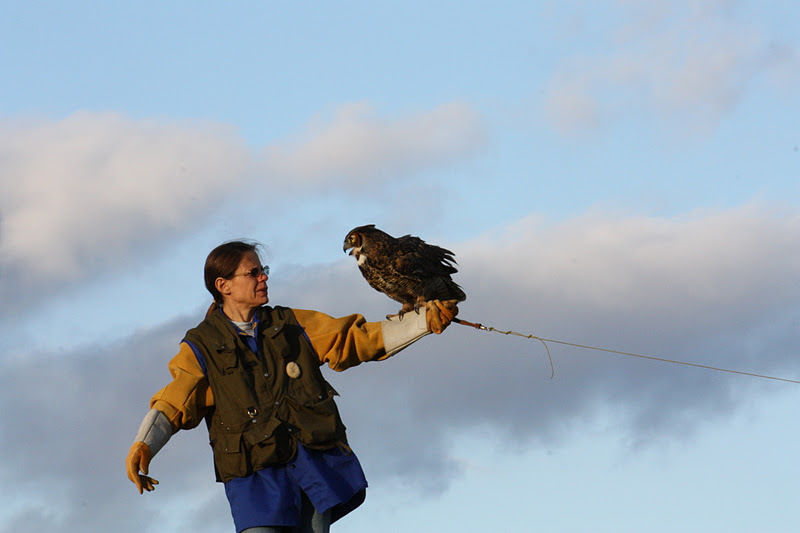 Her husband, Matthew, was graciously willing to drive an hour in the rain at night to take the hawk to Judy Holzman at All Creatures Great and Small Wildlife Center in Columbia, MD. 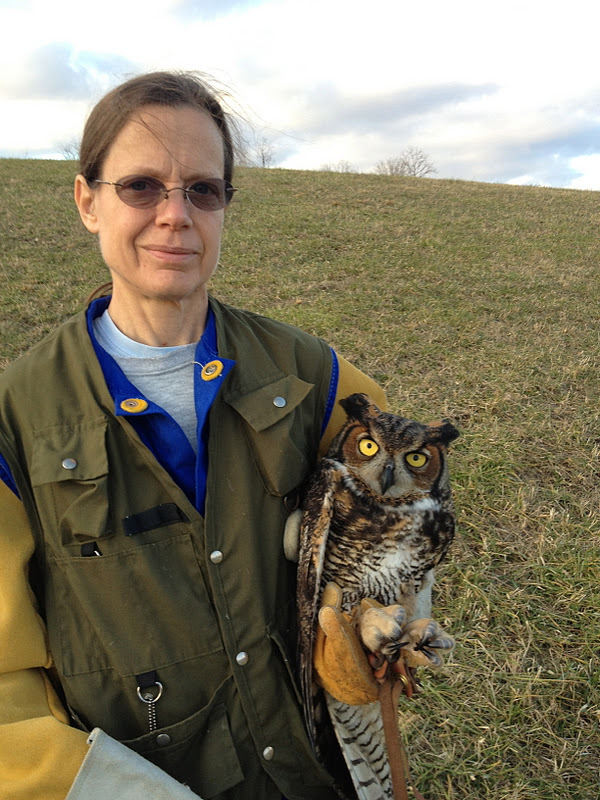 Judy suspected a fracture in the right wing, so the next day she took the hawk to her vet, Dr. Stephen Gold. Dr. Gold x-rayed the wing and found that the ulna was fractured just below the “elbow.” The fracture had been kept fairly well aligned by the intact radius bone, which parallels the ulna. Dr. Gold wrapped the wing to immobilize it. Judy kept the wing wrapped for a full week, and then kept Pasadena on cage rest for another week. 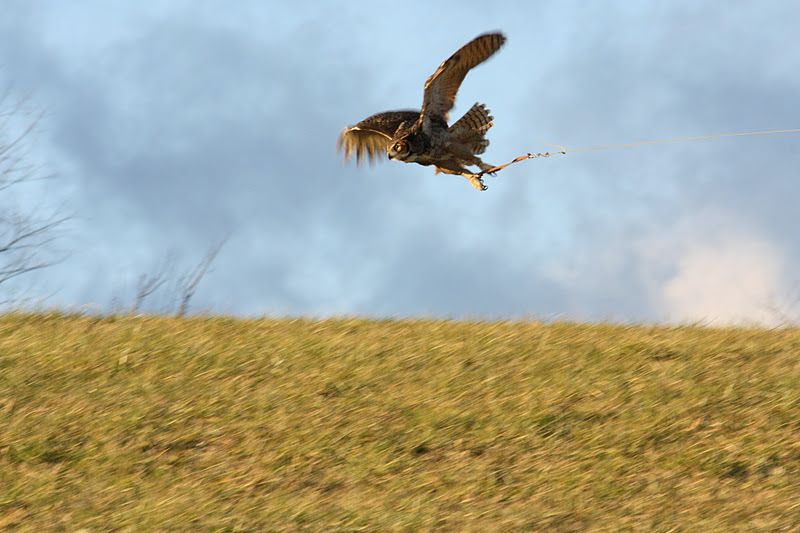 After the second week, She transferred Pasadena to Owl Moon Raptor Center to allow her to begin exercising her wings in the mew. Two weeks is a relatively accelerated schedule for a bird to begin exercising after a bone fracture, but there is a reason for this: With this type of fracture the callus can bridge from the ulna to the radius if the wing is too long immobile, permanently reducing the range of motion in the wing. Thus Pasadena joined Squeak-toy, Soldier-girl, and Rufus, bringing the red-shoulder mew to full capacity. They get a little stirred up when I enter, but seem to remain quiet in between times. I know that they are sharing the food because I do regular weight checks on all of them, and no one is gaining or losing significantly. Pasadena will recuperate in the mew for another week before we begin flying her on a creance line. For now I am doing some gentle physical therapy exercises on the wing when I check her weight. Her range of motion in the wrist joint is slightly reduced, but that is not unexpected at this stage. I hope that by intervening early with physical therapy and flying time we will prevent the callus from bridging and gradually increase range of motion to normal. I am concerned about Soldier-girl. The same bridging I worry about with Pasadena that can occur between the parallel ulna and radius bones of the wing can occur between the parallel tibiotarsus and fibula bones in the leg. I took Soldier-girl to Dr. Barb Stastny at Opossum Pike Vet Clinic last week after I saw her favoring the leg she fractured last month. Follow-up x-rays show that she had fractured both the tibiotarsus and fibula of that leg. The tibiotarsus was broken in two places, a nasty fracture. The callus is large, and appears to have bridged the two bones. It has reduced range of motion in her “ankle” joint (higher on the leg than our ankle) and is affecting the tendons as well. She is not able to grip her left foot tightly or extend the hallux (opposing toe) normally. She sometimes perches with the hallux under the foot, which can lead to sores and other foot problems. Dr. Barb prescribed an anti-inflammatory drug, which will help to alleviate any pain and inflammation that may be causing Soldier-girl to favor the leg, and she will re-examine her after 3 to 4 more weeks of recovery time. Meanwhile, we are doing physical therapies on the foot to try to enable her to extend the hallux, and keeping our fingers crossed. Shredder rests in the grass after a flight. Photograph by Callum Lewandrowski. Rufus, the adult male red-shoulder with a blind eye, is getting around much better than last week. He is more alert, can fly from perch to perch, and is doing less circling to the right. He is finding and eating enough food on his own that he no longer requires hand feeding. While his improvements are cause for hope he still has a way to go in all these areas before he will be self-sufficient. Squeak-toy, the juvenile male, is still hanging out with the others. Because of this I must postpone training him. There is little I can do to train a bird without close control of its weight, and I cannot control his weight while he is group feeding with the other birds His physical therapy has ended. I became convinced that he is no longer benefitting from the exercises. His condition has improved as much as it ever will. Now the time has come to find him a permanent home. Finally, Shredder, the great horned owl, is stronger and more ornery every day; signs that he is nearly ready to leave us and go on his way. His flights are long, he is gaining height, and his stamina has grown to where he can fly for longer periods without getting winded. He is actively flying around in his mews, as well. His progress is great to see. I am optimistic that he will be ready to return to the wild within another week to two. Shredder flying on the creance line. Photograph by Callum Lewandrowski. As we welcome 2012, I want to thank each and every one of you for joining me on this journey. It has now been over three months since I started this blog with the help of my daughter, Natasha Lewandrowski. Writing these stories is not always easy. Frequently I share with you my burdens and sorrows as much as my triumphs and joys. I wish that all the stories could have happy endings, but it helps me to know that you are out there pulling for these beautiful birds as much as I am. I feel your support, and I believe that the birds feel your positive energy through me. I plan to go on writing as long as you are on board and as long as I can find the time to put our adventures into words! I look forward to keeping the momentum going in 2012. Thank you for your support and have a Happy New Year! Suzanne Shoemaker with Shredder. Photography by Callum Lewandrowski.